What better way to celebrate the holidays than with a Branson show? Branson’s most popular Christmas show is back in 2019! For our 27th season, the legacy continues, starring The Lennon Sisters every show and hosted by Jimmy Osmond on select dates. Great variety, singers, dancers, prancing reindeer, the Moon River Orchestra, and maybe even old St. Nick himself… all performing your favorite holiday songs! Also featuring Andy’s favorite specialty act, Pasha and Aliona… The Lennon Granddaughters… Britain’s Got Talent singing sensation Charlie Green… America’s Got Talent dynamic trio “Voices of Glory.” Come enjoy all the variety that made Andy’s Christmas show so spectacular! 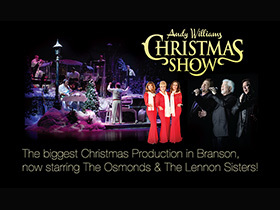 Andy Williams Ozark Mountain Christmas Show will return to the stage November and December. Contact Branson.com today for more info.